Norway Apologizes To Women Who Faced Reprisals For Wartime Relations With Nazis Women who had relationships with occupying German soldiers faced official retaliation after the war. "For many, this was just a teenage love," Prime Minister Erna Solberg said. 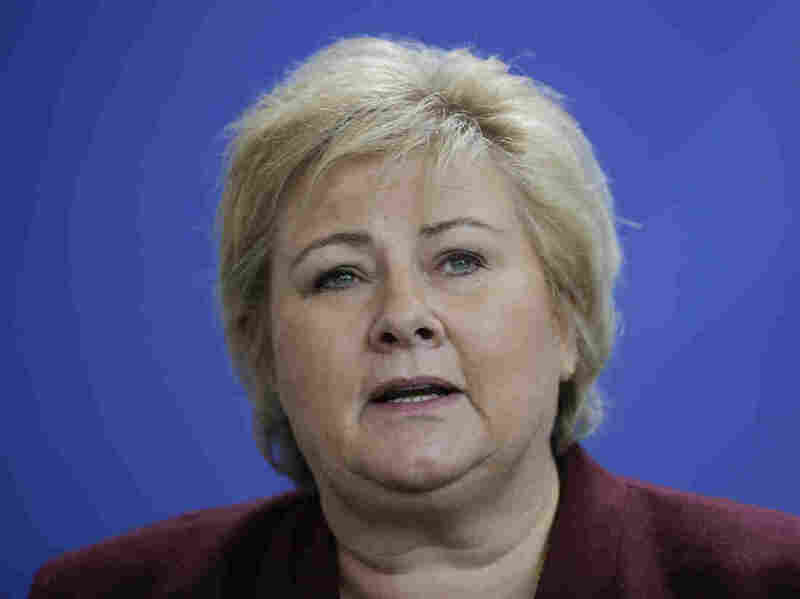 Norwegian Prime Minister Erna Solberg speaks during a joint statement with German Chancellor Angela Merkel on Tuesday. The following day, Solberg apologized to the "German girls" who faced government retaliation for their relationships with occupying German forces during World War II. Norway issued an apology on Wednesday to women who faced retaliation and public disgrace for having relationships with occupying German forces during World War II. Up to 50,000 Norwegian women are thought to have had intimate relationships with German soldiers, the BBC reports. Many of them faced government retaliation after the war's end, including illegal arrests, job firings and being stripped of their nationality. Norway's Prime Minister Erna Solberg issued a formal apology to these "German girls" at an event to mark the 70th anniversary of the United Nation's Universal Declaration of Human Rights. "For many, this was just a teenage love, for some, the love of their lives with an enemy soldier or an innocent flirt that left its mark for the rest of their lives," Solberg said. "Today, in the name of the government, I want to offer my apologies." Many German men occupying Nordic countries were encouraged by their leaders to have children with local women. Lebensborn — which translates to "spring of life" — was the infamous Nazi leader Heinrich Himmler's effort to engineer an Aryan super-race by commandeering the offspring of blond, blue-eyed Germans and similar counterparts in Nazi-occupied countries. Norway's Scandinavian gene pool made it a special target of this racist effort. The country was invaded by Nazi forces in 1940. The New York Times reports the German SS set up clinics throughout occupied territories to ensure healthy births of children born to SS soldiers. "We cannot say women who had personal relations with German soldiers were helping the German war effort," Guri Hjeltnes, historian and director of the Center for Holocaust and Minorities Studies, told The Guardian. "Their crime was breaking unwritten rules and moral standards. They were punished even more harshly than the war profiteers." Women In The World reports the nearly 30 Norwegian men who married German women during occupation did not face government reprisals. The children of these unions were subject to alienation and identity confusion after the war. ABBA singer Anni-Frid Lyngstad, born to a Norwegian mother and German sergeant father, is one of them, The Guardian reports. Lyngstad's mother and grandmother were ostracized after she was born, and immigrated to Sweden soon after. Those who stayed in Norway were subject to social discrimination, had difficulty finding work and reportedly were classified as 'rats' by government officials. These "children of shame" received an apology from the government in 2000.